The end of the Harper era? Like the UK, Canada has a first-past-the-post electoral system. Traditionally, it was a two-party game, with the Conservatives and the centrist Liberals taking turns in government. The 2011 general election was round one in the shake-up of the status quo, as the centre-left New Democratic party (NDP) surged in the polls during the campaign’s closing stages. It became the official opposition for the first time in history. It looks like we should brace ourselves for round two in October. Over the past four months, the NDP has risen from an all-time low in popularity to leading the polls with 30.2 per cent according to the most recent EKOS poll. Conservatives are polling ten points below where they were in 2011 with 29.4 per cent. The Liberals, who were in the clear lead until the start of the year, have fallen to 25 per cent – the level they were at before Justin Trudeau was elected leader in 2013. The left-leaning Green party has increased its standing, from 3.9 per cent in 2011 to 7.1 per cent today. Why the sudden swing to the left? There are two main reasons: Alberta and Bill C-51. Alberta is traditionally Canada’s most Conservative province. Centre-right parties have ruled it for 80 years. On 5 May 2015, the NDP won a majority in the provincial election. The party went from having a mere four seats to 54. Despite the Tories’ advantage as incumbents and a multi-million dollar budget, the NDP won by emphasising its potential as a party of government and by energising volunteers. Albertans had enough of the Tories’ notorious ‘everything-for-big-business’ budgets. They wanted an alternative. The second reason is the government’s unpopular anti-terror bill C-51. Constitutional experts from around the world deem it as an infringement on civil liberties. When little information was available about the details and the government simply played on a politics of fear, public support for the bill was relatively high. Only Elizabeth May, the popular Green party leader, initially opposed it, penning a widely read and controversial opinion piece highlighting the bill’s undemocratic nature. The NDP leader, Thomas Mulcair, and his party ended up vehemently opposing the bill as well. Slowly, as more and more opposition was voiced and protests were held, public opinion changed. Now, the vast majority of Canadians are against C-51. It passed, however, because the Liberals supported it. According to pollsters, many centre-left voters who were supporting the Liberals as the more electorally viable alternative to Stephen Harper, the Conservative prime minister, changed their minds. One of the Liberals’ own candidates even resigned. It is telling that theConservative party grassroots is protesting as well. Because of first past the post, no party will win a majority. As sitting prime minister, Harper will have the first chance to form a government. However, it is unlikely that he will win enough votes. No party would be foolish enough to prop up a Conservative minority when Canadians clearly want change. 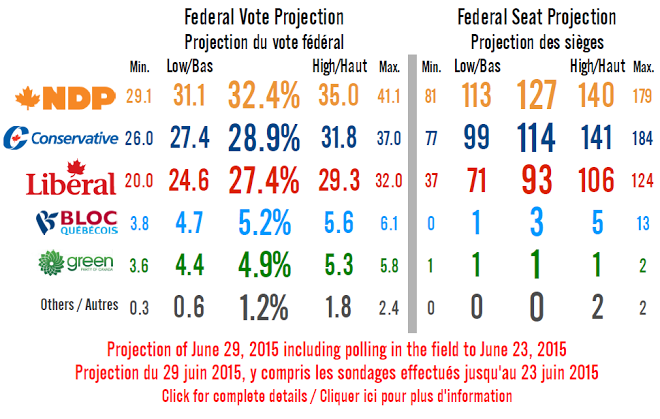 The NDP and the Liberals, maybe with the Greens, will have a chance to form a coalition. While the Liberals have been officially against this in the past, Trudeau’s new platform, unveiled last week, has some ideas clearly cropped from the NDP’s policy book. For the first time in history, the NDP, Liberals and Greens are all advocating electoral and democratic reform. It could be the starting point for a successful relationship in government. Note: This post was originally published as a contribution to Policy Network’s regular ‘State of the Left‘ update on 25 June 2015. Next article Can politicians ever be true to themselves?